The pungent aroma of some pickled daikon & carrots can sometimes clear a room faster than a fire alarm but when added to a great bánh mì it just might be able to bring everyone together again. These pickled jewels add the touch of tang, sweet and sour crunch and flavor to not only bánh mì, but to many Vietnamese dishes. Most daikon and carrots found are shredded finely, but when it comes to home made, you can have fun and create just about any shape, size and thickness. The pungent aroma of some pickled daikon & carrots can sometimes clear a room faster than a fire alarm but when added to a great banh mi, it just might be able to bring everyone together again. These pickled jewels add the touch of tang, sweet and sour crunch and flavor to not only banh mi, but to many Vietnamese dishes. Most daikon and carrots found are shredded finely, but when it comes to home made, you can have fun and create just about any shape, size and thickness. Vietnamese pickled daikon and carrots add a crunchy tang to banh mi sandwiches. These pickled daikon and carrots are also versatile and can be eaten in salads, spring rolls and even along side grilled meat/seafood dishes. The longer the pickled carrots and daikon are allowed to pickled, the more sour they become. 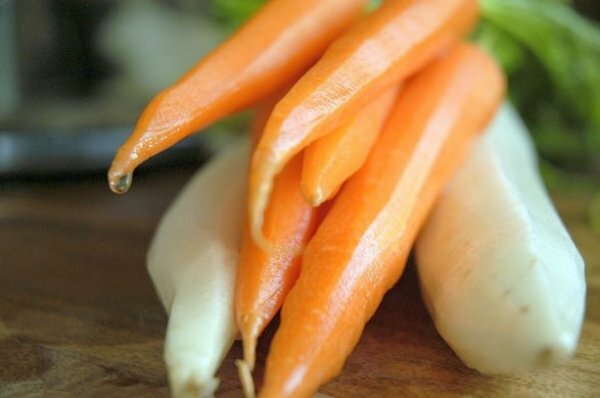 So plan accordingly and pickle the carrots and daikon ahead of time for your menu planning. 1. Mix warm water, vinegar, sugar and salt until everything is dissolved. Choose a pitcher or bowl with a lip that can be used for pouring mixture. 2. Peel, wash and cut daikon & carrots to desired size. Combine both together in bowl and blot dry with paper towel. 3. Fill carrot & daikon mixture into a tight lid jar, bowl or similar container. 4. Pour liquid salt mixture into carrot & daikon container till full. Close lid and let it pickle for about 3-5 days, or till desired sourness. For immediate use, let marinade for about 1 hour. Log in | 56 queries. 0.210 seconds.